Please refer to the questions below for answers to the most common questions we receive about the competition. If you are in need of technical assistance please email us and we’ll do our best to assist you. The submission fee is $25 US. This is approx. $32 CAD | $195 HKD | 21 EUR | 19 GBP. Photographers from anywhere around the world, 34 years-of-age or under as of December 31, 2018. Flash Forward is specifically focused on emerging artists. While there is no universally agreed-upon definition of this term, for the purposes of this project we define it by age. Do age restrictions apply to all Magenta projects, or just Flash Forward? Just Flash Forward. 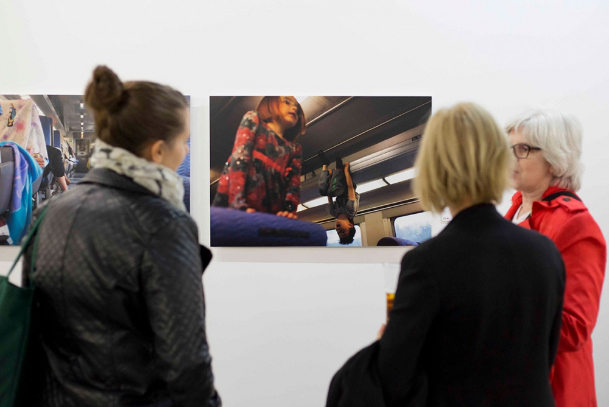 Other Magenta projects, such as monographs, the artist portfolios and reviews in Magenta Magazine, etc., and the curated exhibitions and other events are not age-specific. How will I know when I can apply for next year's competition? The Flash Forward Call for Entries usually starts in the month of October each year. Sign up for our newsletter if you want to be sure of getting the news in a timely manner. You can also keep an eye on our Submittable page. The Flash Forward competition winners are announced in the month of May each year. Special events (eg. book launches, exhibitions, etc) are scheduled in the Fall months. Submittable is a submission management software. Why does it say I have to Sign Up for a Submittable account. What does that mean? Signing up for a free account allows you to save your permanent information, such as your contact info. It also allows you to choose a password, so that you can at any point log back into Submittable to edit your information. If you want to submit to another Magenta project in the future, you can just log in, and your permanent information will already be there. I've submitted to previous Magenta projects. Does that mean I'm already registered? No. All artists wishing to enter our Flash Forward Competition must register an account with Submittable. Can I see my information after I've uploaded it? Yes. You can log in at any time and view your submission. You can create a submission draft using Submittable. You can later log into your Submittable account and continue working on your submission until you are ready to submit it. Can I edit my submission at any time? No. Once you finalized your submission by clicking the Submit button, you will not be able to edit it. Can I make two separate submissions to the same project? No. Only one submission per artist per project, please. Do the images all have to be from the same series or body of work? Can I submit images that are meant to be viewed as a diptych or triptych? If so, does that count as one image, or two or three? You can certainly submit diptychs or triptychs. Each actual image file that you upload counts as one image, even if it is an installation shot of two or three images grouped together. Conversely, if you upload three image files that are meant to be viewed together, those still count as three images. You can upload a total of ten image files. Can I upload my images in .png, .tif, .psd or .pdf format? What about videos? Slideshows? Interactive web art? No. Please submit only .JPG images. Your images will be viewed by the jurors via a web interface, and need to be able to be embedded in a web page as standard images. Can I just link to my images on my own website instead of uploading them? No. Your images need to be viewable in the web interface that our jurors will be using, not off on some other web site. What does it mean when it asks for the images' dimensions? The pixel size, or a print size, or what? That refers to the size you would want to exhibit the work at — i.e. if you were asked to provide a print for an exhibition. It’s there so that in the event that you’re one of the winners, the jurors putting together the exhibition can decide which specific works to show and how to arrange them.